Anyhow, I like passing along information and occurrences at the office, and I really enjoy contemplating the happenings in the coin market. Regrettably, sometimes it’s not the greatest of news. This week we spoke to a few collectors who came to us discussing some troubles that they had with other dealers and peripheral businesses in the hobby. Unfortunately, there really wasn’t a lot that we could do to help them at the time. It was too late. However, it really burns us when these things occur, and we wish for a better outcome for the customer, whether or not it helps DLRC in the long run. We don’t pretend to be the only coin dealer in the world (we’d run out of sources of coins! ), but we like to think that we’re pretty darn friendly and a great resource to work with. We’re happy to offer full services to all our collector-friends, and we give a lot of free advice. We hope bad situations don’t sour the hobby for you, and that you come to us first so that we can work with you, serve you, and assist you. We want to be your Partners in Collecting and build a relationship. At the office, we welcomed an intern this week, Matt Trookman, who is coming to us through the PNG Internship Program. He’s our first PNG Intern and has been a great help in his inaugural week. He’s been sifting through some long-forgotten projects in between working with the coin group, and we’ll have some fun Kennedy Varieties to offer in a few weeks based on his results. He’ll be in Baltimore with us, so please stop by and say hello. We’ve also seen Mike Coari (my trusty traveling sidekick) move over to head our shipping department. For those of you who knew Thomas Scott, he handled that desk for 14 years and had a calling to head out west. While moving Mike to hang out with Mary Lee and the gang was a good move, he’s greatly missed outside of my office. Otherwise, it’s the same old week with a ton of packages arriving and departing and a lot of fun and new numismatic items. This week you’ll see some of the fruits of our recent labors below and we hope that you enjoy reading! Why we love it: A quite rare Carson City Mint Issue Liberty Quarter Eagle with pristine, nearly uncirculated surfaces that display almost no visible wear and absolutely no notable blemishes. The eye appeal of this AU piece is simply lovely as the coloring is perfect yellow-gold and its original mint frost is still evident. From a low mintage of just 16,980 coins originally struck of this issue, there are surprisingly just three examples graded finer at PCGS with none in Mint State. Value: The most recent sale of a CAC-approved, PCGS-graded example of the same date and grade took place in May of this year and brought $29,375. This example we have featured in this week’s auction is reserved comparably yet still a few hundred dollars below for just $29,000! Considering the AU58 just realized nearly $36,000, it shows that the value is right-on! Why we love it: The history of DLRC is covered with Barbers. In fact, we’ve considered the tagline of “DLRC: The True Home of Barber Collectors,” but we’ve gone for the more general “Your Partners in Collecting” and “For the Love of Coins” in the past few years. Nonetheless, we’ve handled many of the finest (and nicest!) Barber coins, and this piece belongs right in there! A beautifully, pristine superb-gem Barber Quarter, not only high-end for the grade but possesses unbelievably gorgeous toning. The color this coin features is both relevant and rich on both the obverse and reverse. The toning is highlighted mostly with rose at the center and blue surrounding it with some subtle tints of green and gold throughout. Tied with three others in this grade, it is bested by only a single MS67+ at PCGS. Gorgeous and Registry-Quality, this piece is sure to please the most discerning of collectors! Value: The PCGS Price Guide has this coin valued at $12,500, yet it is available for purchase via Make Offer for the low price of just $11,000. With the only other CAC’d example recently bringing $10,869, we think that a serious Registry Collector is likely to jump on this piece as the MS67+ is not available. 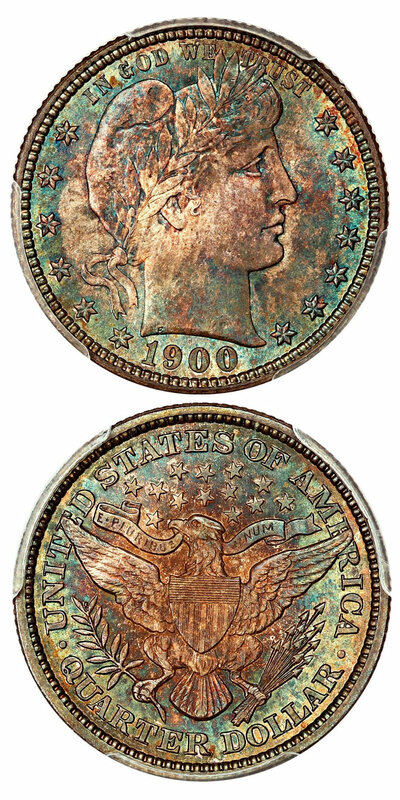 For a full $1,500 below the PCGS Price Guide Value for this gorgeous gem Barber, we see it as a great deal for the collector/investor. Why we love it: A better date Peace Dollar from the San Francisco Mint that becomes especially rare when found in gem condition. This ideal gem example displays pristine, lustrous surfaces that are mostly bright white with subtle gray tints appearing on both the obverse and reverse, which gives this scarce, desirable piece, lovely eye appeal. There is only one example of this Peace Dollar issue graded finer across all grading services. Value: The PCGS Price Guide has this coin valued at $26,500 with the CPG Value just below that at $24,200. While these numbers are a bit skewed due to a few exaggerated sales, this gorgeous gem NGC-graded example is available in this week’s auction with the reserve set generously low at just $13,250. That is five figures below either price guide for this S-Mint Peace Dollar that becomes an underrated rarity in gem condition. Why we love it: A scarce, underrated later date in the Seated Half series. This amazing superb gem example is perfectly pristine as it shows no notable blemishes and all its original, blazing luster. The eye appeal is then completely perfected when you factor in its beautiful rainbow-colored rim toning. This Liberty Seated Half Dollar is tied for the finest known example graded by PCGS of its issue, which comes from a low business strike mintage of just 12,000. Value: The PCGS Price Guide has this coin valued at $11,500, yet it is available for purchase via Make Offer for the extremely low price of just $7,500! That is an incredibly generous, full $4,000 below the PCGS Price Guide Value for this stunning ultra-gem Seated Half even with its excessive luster and pretty toning covering the periphery of the coin! 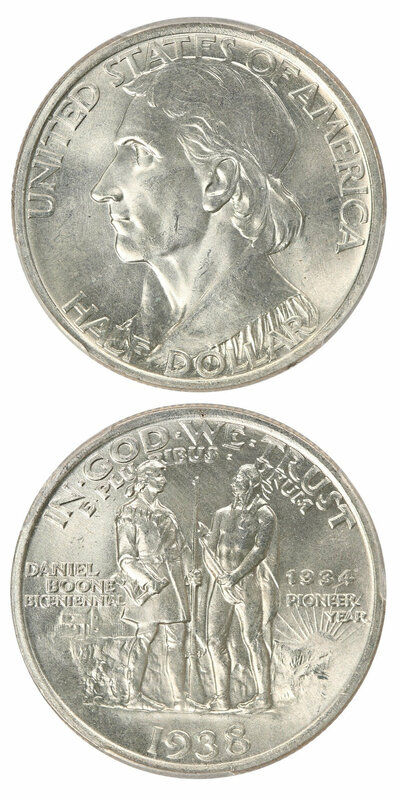 Why we love it: One of our favorite key dates of the 20th Century, this is a famous, scarce issue that is highly desired by all collectors of U.S. coinage. This particular example displays pristine gem surfaces that are covered in strong luster with mostly red coloring that features pretty, darker streaks across the coin making for fantastic eye appeal. We love the 66 RB grade as it’s far more affordable than a 66 Red (or finer) at half the price, but the coins typically are far more natural in color and are consistently mark-free. This coin is no exception to the generality and is a beautiful piece with only one example graded finer by PCGS with Red Brown color. Value: The PCGS Price Guide reflects a value of $5,500, but these typically sell for quite a premium over the conservative pricing there. With the last example bringing over $6,750 in auction, this piece, with a reserve of just $6,000 comes in at a reasonable level. Why we love it: An early, rare Half Eagle with lovely eye appeal from its pretty yellow-gold coloring that is complemented nicely by its light orange rim tones. This particularly nice example of the popular series comes at an ideal grade as it is both priced low and sees a high price jump to a MS63. This Capped Bust Half Eagle issue comes from a low mintage of just 51,605 coins originally struck. Value: The PCGS Price Guide has this coin valued at $17,000 yet it is available for purchase via Make Offer for the extremely low price of just $12,000! That is an incredibly generous, full $5,000 below the PCGS Price Guide Value for this attractive early Half Eagle! Why we love it: Most purists may be screaming that it’s simply heresy that we listed a modern coin here…well, yes. We love the Accented Hair variety and based on the number of examples of these that we sell, I think that our customers do as well. This is a stunning ultra-gem deep cameo Kennedy Half Dollar of this scarce and popular Accented Hair variety. This nearly perfect example is blemish-free and immaculate in every sense of the word. Its frosty devices and flashy fields that create ideal contrast give the coin gorgeous eye appeal. There are only 20 examples of this Proof Kennedy Half Dollar Variety graded finer by PCGS. Value: A recent sale of the same date, grade and variety combination sold in auction just last month for $3,642.50. The PCGS Price Guide even values it a bit higher at $3,850. This example offered here in our weekly auction is reserved comparably, yet still lower than both previous amounts at just $3,500! Why we love it: The perfect Capped Bust Half Dollar type with lovely toning. The color is deep and beautiful as it displays a pretty rose center with blue around the periphery, which are highlighted with a few spots of gold shining through. That along with subtle underlying luster and no noticeable marks makes for nice eye appeal. There are only eight examples of this Capped Bust Half Dollar issue graded finer by PCGS. Value: The PCGS Price Guide has this coin valued at $5,000 yet with the premiums of CAC approval and gorgeous toning that come with our piece, we have it available for just $5,250 via Make Offer. 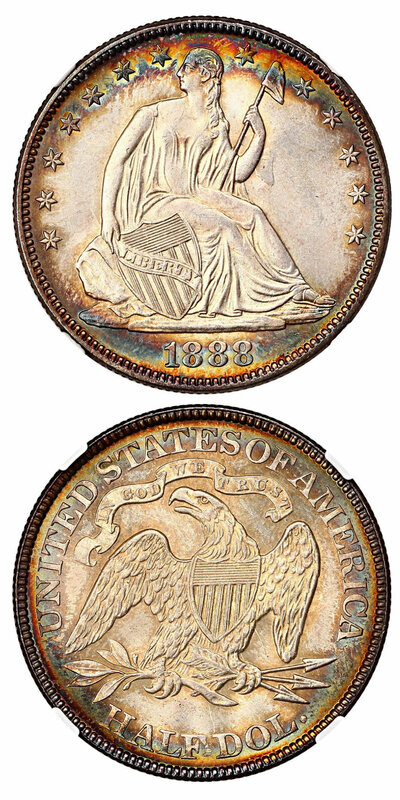 That is right in the ballpark with the PCGS Price Guide Value even with the color and CAC sticker making this a fair value for the perfect 1820’s Bust Half type coin. Why we love it: A gorgeous, lustrous near-gem example of this Franklin Half Dollar issue that increases in desirability as it possesses Full Bell Lines. This lovely coin displays blazing luster and mostly white, well-struck surfaces. Between the excessive amounts of luster and incredible eye appeal, this coin truly represents the grade well. Value: The CPG value for this coin is set at $260 with the PCGS Price Guide sitting at $250; however, it is available via Make Offer for $200. With a discount around $50 off both price guides that is a fair price for this bright white, lustrous near-gem, Full Bell Line Franklin Half Dollar! Why we love it: A popular and desirable issue that commemorates the 200th anniversary of the famous frontiersman's birth. P, D and S-Mints were issued in '35, '36 and '38 but in ‘37 only D and S-Mints were issued, none at Philadelphia. This gem example displays blast white surfaces with incredible amounts of luster giving this piece nice eye appeal. Value: The PCGS Price Guide has this coin valued at $675. It is available for purchase a good bit lower than that number at $525 via Make Offer. That is a fair value at $150 below the PCGS Price Guide for this stunning gem example as this commemorative issue offers high popularity and desirability! Why we love it: This popular and scarce California Fractional Gold issue features frosty devices and flashy fields with attractive and original golden coloring. This Territorial piece’s beauty, lack of major blemishes and clear, sharp details in the devices add up to a nice, ideal eye appeal. Used as currency by the many people who traveled the road to the California Gold Rush, these pieces are popular amongst collectors and historians alike! Value: The PCGS Price Guide has this coin valued at $400. It is available for purchase at the reasonable price of just $365 via Make Offer. That is $35 below the PCGS Price Guide value for this scarce and desirable California Fractional Gold issue! Auction #1036 Lots Posted. Browse & Bid Now! Entire Catalog of the DLRC Press Once Again Available Online!